Connect like a Rock Star! I was thrilled and blessed to see Chris Isaak in concert last night at The Kent Stage, in Kent, Ohio, and have to say it was truly a highlight of my year. Not only does Chris, and his band Silvertone, put on one heck of an entertaining show, but they also demonstrate what it truly means to connect with others. Connectors show appreciation for others. At the end of the opening song, Chris said, “Thank you for coming out tonight and supporting live music.” This resonated with me for a couple of reasons: 1) It was a snowy day, and the roads to Kent were not in fabulous condition. Having driven 3 hours to get there, we passed no fewer than 6 vehicles off the road (some in the ditch, some in the median, one Durango that looked as if it had rolled across several lanes, spilling its owner’s things thru the median and across the highway). Kent is a bit out of the way; it’s not far from Akron or Cleveland, but a bit off the beaten path. 2) We have so much access to music of all kinds at all hours of the day, fairly inexpensively. Attending a live concert these days is a bit of an investment — tickets, travel, maybe dinner out and a hotel for longer-distance travelers. In addition, while the tour is titled “Chris Isaak,” it’s not all about Chris. He showcases each member of the band separately during different parts of the show, allowing each to shine with his instruments of choice. He also highlights, and pays tribute to those performers who inspired and mentored him…from Johnny Cash and Roy Orbison to Carl Perkins and Elvis. Connectors create entertaining experiences for others. Chris and Silvertone put on a SHOW! For them, it’s not all about flash and special effects, unless you count the sequins or mirrored panels on the suits Chris wears when he’s entertaining! The Kent Stage has about 620 seats, old movie theater style, so there wasn’t a bad seat in the house, and the band took full advantage of being able to interact with the audience. Chris and his guitarist, Hershel, were both out performing in the audience during a couple of different songs. They tell stories, they make fun of themselves, they do some fun moves together (imagine the stage shows of bands in the 50’s and 60’s), they even had one of those ridiculous dancing Santa’s on-stage — you know the ones, they move when they are activated by sounds around them. They encouraged us to get up and dance and they performed for a full two hours. Connectors respond to the needs of others. As I mentioned, they were out among the audience performing. They invited a few audience members on stage to dance with the bass player. They did a couple of songs based on requests yelled out by members of the audience. If you’ve been to a concert, you know they have a “stage set” or planned play-list that they work their way through. Yes, they had a stage set, and I’m sure they stuck to most of it, but they also improvised in response to the audience. Finally, there is something so powerful about watching people perform in their passion zone. These guys have been playing together for 25-30 years, and it shows. They were having a lot of fun, and so were we. It was one of those experiences during which I was truly “in the moment” the whole time. If these guys are coming to a venue near you, I highly recommend seeing them, you won’t regret it! These two have over 40 years of professional speaking experience and they are ready to share it all with you…what it’s really like to be a professional speaker. Consider it EDUTAINMENT in its highest form! 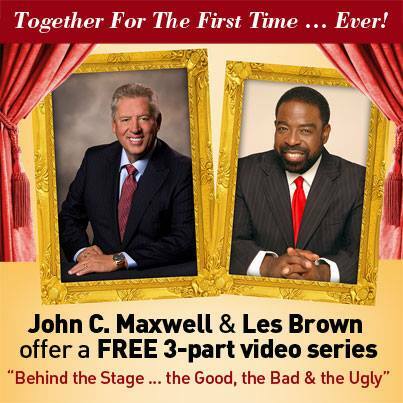 You’ll learn about the speaking business, as well as laugh with them at some of the experiences they have had and share in this video series…If you’ve ever heard Les Brown laugh, you know this is going to be fun; and if you haven’t, you are in for a treat! Did I mention the 3 videos are not only FUNNY but are FREE? This launched yesterday, Wednesday, October 23rd. Here’s the link…After you’ve watched it, tell me what you think! So, how do you do that? You must establish high standards and inspire others to adopt them, as well. You must be fully immersed in, and committed to, raising the bar on all aspects of your performance, continually striving to get better. You must be willing to banish a “check the box” attitude because you know that “good enough” is not good enough! You must understand you aren’t done, until YOU are done; you don’t base your success or completion on other people’s standards, you keep going until you know you have achieved excellence. Of course, these things are not possible without high levels of integrity. Will Durant said, “We are what we repeatedly do. Excellence, then, is not an act but a habit.” Every day, you have the opportunity to influence at least four people (and I do mean “at least,” because I believe the true number is significantly higher), which means you have the opportunity to be an excellence role model and encourage others to focus on and demonstrate excellence in what they do, as well. Having focused on excellence over the past four weeks, what have you learned about yourself? Your organization? How do you rate yourself on this aspect of your leadership performance? We’ve been focusing on excellence all month, and perhaps you’ve already come to this place, but I’m curious. What is your motivation for pursuing excellence? How will a life of excellence impact others? What motivation will sustain you to pursue excellence day-in and day-out? I’ve given this some thought, as while I realize this will sound trite, for me, if a thing is worth doing, it’s worth doing well. If I’m going to exchange my time and life energy — both of which I can never get back — I want whatever I spent it on to have meaning and value, and not just for me, but for the others around me, as well. As I have said on several occasions, I am here to change the world through encounters with people each and every day. I can’t do that without doing what I’m doing at a high level of performance. Well, I suppose I could, but my quest is to change the world in a positive way, and that takes focus, attention, intention, energy, and effort. I remember being told, by at least three different people, at three different jobs (yes, this is absolutely true! ), that I could “relax now…and not work so hard.” I asked each of those people to describe to me what that would look like or be like, because I wasn’t sure what they were attempting to guide me to do. You see, I was working at what I consider “normal Laura level,” not in comparison to anyone else. I wasn’t sure what “relaxing” would mean. None of them were able to describe it for me. I still don’t know. I want to make a difference. I want to set a positive example. I strive to leave things better than when I found them. And, when I leave a place, I want the people I encountered to say I did my share; I did quality work; and the place was better for my having been there. What about you? What are your thoughts on this topic? Each of us — as individuals, teams, and organizations — has been given something for which we are responsible. Historically, stewardship was responsibility bestowed upon someone to take care of another’s property or wealth — perhaps the King, a Lord, or a landowner. Essentially, the steward would manage those assets with the intent of leaving it in as good of condition as we found it, if not better. Today, we often think of this with respect to the environment, resources, wealth…Sometimes, however, we are more focused on acquiring and consuming than we are on caring for the things we already have. The irony, however, is that we often gain more when we take care of what we have.I think back to 2008. I was moving my family from one area of Washington State to another, as I had taken a new job. We didn’t find a house we wanted to buy, so we decided to rent for a while. A co-worker told me about some new houses that had been built, but not sold (it was a tough real estate market), and suggested the builder might be willing to rent. I called and inquired; he said he would consider it, and we agreed to meet at the home to walk through it and discuss the idea. It wasn’t long after we walked into the house that he said he would rent to me. He explained that he had taken a good look at my car before coming into the house and because it was clean and well cared for, he believed I would take care of his home; had my car been a mess, we may have been looking for a decent place to live for a while longer! Apparently, I was considered a good steward! Your team/organization has also been given resources to manage. The question is, how have they performed? Today, task them with a self-assessment to determine if they –as individuals — and you as a team/organization are providing excellence in the small things. Then, challenge yourself and them to go the second mile, and provide an even higher level of excellence. What assets are you managing? How are you managing them? Are you squandering them, or are you in a good position for when the owner returns and wants an account of what you have done with what you’ve been given? What changes can you make, to move your performance up a level? Living not too far from Pittsburgh, it’s hard to not hear a lot about the Steelers (Note — I’m not a big sports fan, but the business is full of leadership lessons — both on the side of how to do it, as well as on the side of how not to do it; so I will, from time to time, use sports stories as examples in my blog). Champions are champions not because they do anything extraordinary but because they do the ordinary things better than anyone else. Have you found this to be true in your life? I believe it. You don’t need to do anything extraordinary or complicated. You simply need to do whatever it is you do, extremely well, with a focus on doing it at levels higher than average…with excellence. So, what small things so you do that lead to excellence in your personal and/or professional life? What small things does your team/organization do that lead to excellence? Can’t wait to hear what you come up with. Hint — use the “comments” box below!